The owner of the ModernWarfare3.com domain has been ordered to turn it over to Activision. It came to light in July that the ModernWarfare3.com domain, which you might assume Activision would have put a death-grip on years ago, was actually in the hands of an unknown individual who had nothing to do with the company or the game. This naturally did not sit well with Activision, which filed an official complaint with the Internet Corporation for Assigned Names and Numbers claiming that the domain was being used in bad faith and demanding it be turned over to its control. Score one for Activision: a three-member panel of the National Arbitration Forum has ruled in its favor and ordered that the domain holder, identified as one Anthony Abraham, hand it over. 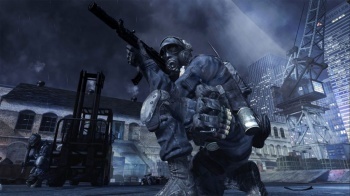 Abraham, a die-hard Battlefield 3 fan who was using the site to bash the upcoming Modern Warfare 3, claimed in his defense that the term "modern warfare" is generic and "not monopolized" by Activision. The panel, however, agreed that Activision had proved its case on three points: that the domain name is "identical or confusingly similar" to its trademark, that Abraham had no legitimate interest in it and that it was being used in bad faith. The domain has been mostly offline since the controversy began and was still unreachable at last check. No time-frame for the transfer was given in the ruling, which can be read in full at the National Arbitration Forum, although I imagine it would be expected to be more or less immediate. And while Activision isn't exactly the easiest company to sympathize with, in this case I don't there's any question that it was in the right. Modern Warfare 3 comes out on November 8 for the PC, Xbox 360, PlayStation 3, Wii and Nintendo DS.